The microscope is very big and heavy. From eyepiece to base it stands about 18″ and must weigh in excess of 10 pounds (my guesses). The height of the eyepieces is very nice since you don’t have to bend over to observe. The stand incorporates a powerful sub-stage illuminator in the base. The sub-stage condenser is mounted into a ring which is raised and lowered by a very well machined rack and pinion assembly. The condenser assembly has an adjustable stop to prevent the slide and the objectives from being damaged by the condenser as it is elevated from below. A 1.30 N.A. Abbe condenser with an iris diaphragm is standard. I also have the dark-field and the phase contrast condensers. The X-Y mechanical stage is mounted on ball bearing slides and has concentric knurled knobs to control movement. There is a variety of spring-loaded slide holders available, some of which have calibrated scales. The head contains the eyepieces and the objectives. The optical head fits into a ring on the stand and remains at constant height. Adjustable stops are used to centre the optical head over the light path. The head is able to rotate a full 360° relative to the stand. The stage and the condenser mounting are raised and lowered together via concentric fine and course focusing controls. The fine focus has a calibrated micrometer scale. The focusing controls are set in ball bearings. The stage assembly has an adjustable stop to prevent the stage from being elevated into the objectives. The focus controls have a clutch to prevent damage to the focusing system when the stage is restrained from further elevation. All of the sliding bearings are made with adjustable spring loaded gibs to eliminate mechanical play. You can see large silver metal plates extending vertically on both sides of the stand just behind the stage. Those are the gibs for the entire stage assembly. The optical head is of the classical 160 mm tube length design. There are compensating optics in the head and the eyepieces for residual corrections to the image. To obtain maximum performance the body, objectives and eyepieces that were specified by B&L must be used together. The main optical body of the DynaZoom is sophisticated. There is an optical prism to split the image to the eyepieces. As the interpupillary distance is changed, the eyepieces extend or retract to maintain the length of the optical path. As the interpupillary distance is adjusted, the image remains in focus and undisturbed. The silver knob on the top of the body operates the 1×–2× parfocal optical zoom feature. The scope pictured is the flat-body model, which is fitted with four parfocal flat-field achromatic objectives, 4×, 10×, 40×, and 100× (oil). Residual colour is next to nil. One can tell that these are fine optics, but I just don’t have the exposure to other good scopes to rank the quality. The eyepieces are of the wide-field, high eye point type that are particularly comfortable for those wearing eyeglasses. I’m astigmatic so I really need to wear them while observing. Not pictured is a small matching step transformer to adjust the light intensity. Not obvious from the pictures is a 2″ diameter well, located at the point where the light exits the base of the scope before it enters the condenser, that accepts special B&L optical filters. The light source is an incandescent bulb that puts out a lot of light for use with dark-field and phase-contrast attachments. So for ordinary viewing, B&L supplied thick and thin blue daylight filters and a series of neutral density deposited metal on glass filters to provide a white daylight field of the correct intensity. Using the lower power objectives without the neutral density filters generates a field bright enough to be unpleasant. Editor’s note: Aaron comments that this stand is well-known in the States, but I must admit I had never come across it until now. I am sure this description will interest many British readers. It sounds like an excellent professional quality stand. 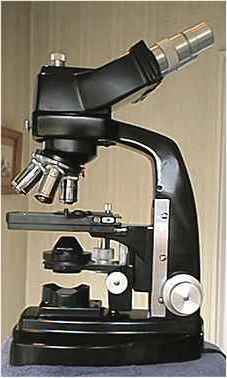 In my own large Russian stand, I find the ability to change the magnification without fiddling with eyepieces most useful.